Bigblackdogpokerblog: 'No one likes us' & a 2nd!! 'No one likes us' & a 2nd!! On the tues we belted down the M6/M1 to see Millwall play MK Dons,i must say its a good stadium and i can see when it will be finished why they have put themselves forward to be a national venue. My boss is an ardent Millwall fan,exec box down at the New Den & in the terraces at the away games...........(no more on that!!!!) We must have picked the coldest night of all year to go,they were still shovelling snow away with 30 minutes to go!! I must admit the fans were realy pleasant especially to MK manager Paul (ex-hammer) Ince!!! Anyway, we (i say we as i was with the gaffer) won 3-1,a good result & a right good laugh!! We stayed in Solihull for the duration,i will recommend Zizzi's for the Italian grub & the Slug and Lettuce for the evenings boozing!!! 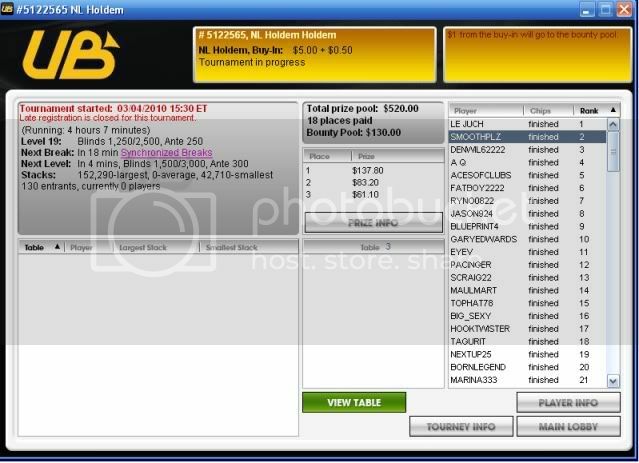 Since ive been back i have dabbled a bit on line,tonight i played the $5 mtt that attracts a small field & got 2nd! Am i ever going to win 1 of these fuckers? Lots of FT's,it must come soon!! The winnings with several bountys was about 90 bucks so i'm happy with that!! Right,take it easy & glglgl. You'll definately bink one soon. All these close calls have to translate into a win sooner or later. You certainly got the skillz, I remember how well you always did in the RTR games. Cheers Mik,i appreciate your comments,ive been studying hard,reading strat posts etc & just trying to build up slowly (again!!) without spazzing the lot off!! I know i need to put more volume in but so far this year i'm pleased with my progress.